A healthy lifestyle is within reach. If you are looking for recovery from substance use, our expert staff can help. PFH Treatment Services provides an array of specialized services to help stabilize lives and move toward healthy living. In 4 states, we provide both Adolescent and Adult Substance Use Rehabilitation. In Missouri & Kansas, Prevention Services are offered to prevent future generations from suffering the problems related to substance use. 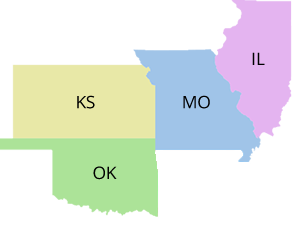 In Missouri, we provide SATOP traffic offender services. In the St. Louis Region, Bridgeway Behavioral Health operates Adult substance use services while our Adolescent services operate under the Preferred Family Healthcare name. Also, in the St. Louis region Team of Concern (TOC) provides school based preventive education. My counselor is awesome. She is non-judgmental and assists me to make positive life choices.